This Thursday, June 28th the Civic Theatre in Allentown is teaming up with the West End Alliance and the city to host a ‘black and white’ street fair and silent film event from 5pm to 9pm. The street fair will feature music, food, and children’s activities. Charlie Chaplin, Marilyn Monroe, and Marx Brothers impersonators will be roaming around as will Ben Mauger’s vintage jazz band. The first 250 people at the event get a coupon for a free Yocco’s hot dog. 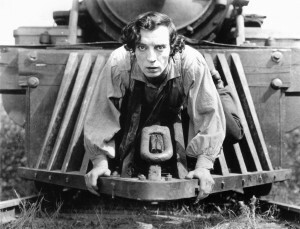 The evening culminates in the 7:30pm screening of Buster Keaton’s classic silent comedy “The General” which will feature organist Don Kinnier providing the soundtrack on a 1928 Moeller Grand Organ. Tickets for the movie are $2.50 for kids and $5 for adults and can be purchased in advance online here, at the Civic Theatre box office, or by calling the Civic Theatre at 610-432-8943. Yes, yes, yes! 19th St will be closed between Allen and Liberty Sts. to host a mini Fair with plenty of fun activities for all! We (WEGC) will also be participating by selling our roast/smoked pork sandwiches in front of the 514 Theatre. There will also be hot dogs, pizza, and cake available. Come out, dress up like a flapper or your favorite old Holywood Star if you’d like, and join the fun. It’s going to be a hoot!